In effect, we were creating a “maelstrom” of examples that we wanted folks to get sucked up into to get a sense of the chaotic nature of learning on the web. We highlighted what turns out to be a pretty interesting collection of examples, and I think we may very well be able to lay claim the first academic journal references to Massive Open Online Courses. Natch, we wrote about MOOCs before they were cool. But, as I will explore in my talk on Thursday, so many of these vignettes are pieces that started to come together when a community of folks started to architect the online, open version of ds106 in the Spring of 2011. A “space of one’s own†,” class-based mashups, spontaneous connections, serendipitous collaborations, and the ever-venerable syndication bus can all be seen as the building block of ds106. Interesting how so many ideas that were percolating around this time, fueled by the excitement of EDUPUNK, remain exactly the things many of us are still working towards. A Space of One’s Own was instrumental to the personal cyberinfrastruscture at the heart of ds106 that enabled us to imagine a syndication bus we can build around it. A technical means to manage a distributed network of folks that share the work from their own space to a syndicated course hub. Spontaneous connections through Twitter hastags like #ds106 make for serendipitous collaborations and an amazingly distributed course experience. The very logic of the LMS might be understood as a mausoleum for the internment of any and all possibilities for an individual to control, manage and openly share their own thinking with the community at large—it is within these darkly sealed crypts that you will find the mummified corpses of learning. Alternatively, syndication buses represent a space through which individuals within a learning community can share their work through personal publishing platforms that they maintain ownership over. Rather than locking information into centralized systems, institutions should be designing a syndication-oriented framework that empowers its members to add their own syndicated voices to a larger, streaming conversation that can be filtered and visualized through semantic tags and categories. I am reminded just how tightly we have begun to make syndication hubs work fairly seamlessly when it comes to ds106. 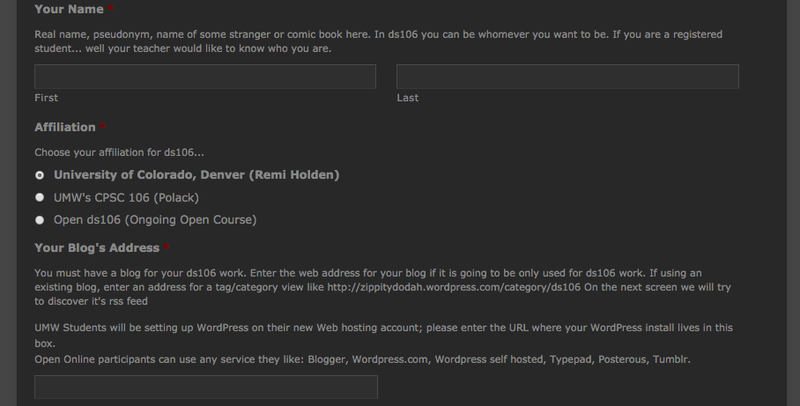 For example, Remy Holden is having his students at University of Colorado, Denver sign-up for ds106 right now. He’s using the ds106 tag template for his course as an aggregator for students’ posts. And guess what, it’s pretty seamless. They complete a form asking for their name, institutional affiliation, blog URL, feed, and Twitter handle, and it’s all done. Alan added context specific code (and short codes) for the class tag which provide a quick, aggregated course page. Links to the syllabus, assignments, list of student blogs, how many posts, random comments, etc. It’s an awesome template that a professor can decide to use, or not. Either way, it acts as an aggregator that they can take the feed for and syndicate the posts where ever they want. The EDUGLU Syndication Bus in full effect aggregating anything that has a working RSS feed. Booya! I had to do a few backend copy and pastes for the sidebar code to create a dynamic tag-based course page, but I imagine that could be automated so that a faculty member fills out the course information form at ds106.us and much of the tag-based template page is automated. Alan has created some amazing instantiations of the syndication hub for a few years now. And as I revisit EDUGLU and the syndication bus yet again in preparation for my talk on Thursday, I am blown away by all the amazing progress that has happened in this arena over the last seven years since we wrote that article. 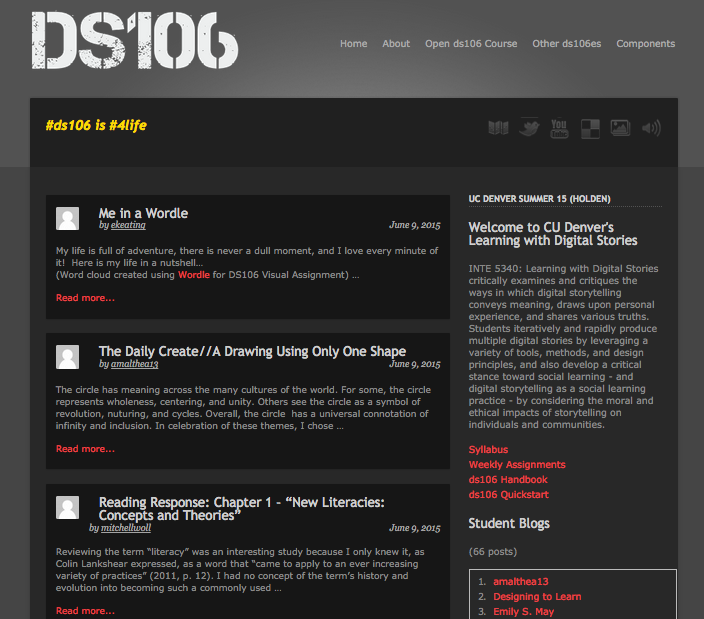 ds106 is a model for online course design that is truly on and of the web. And it was built by many people, and tells a story of collaborative, community-based contributions that offers a powerful argument for experience-based design that studies the action of the whirlpool that is the web and cooperates with it rather than putting it back into a box. The mission has remained clear, despite all the distractions and hype. Create a technical infrastructure that empowers both faculty and students to become the sovereign source of their online presence for teaching and learning. While at the same time, enabling quick, targeted aggregation and syndication of their work within a broader community context so they can explore, discover, feedback, and share. The syndication bus #4life. † I hadn’t committed to “domain of one’s own” yet, though I already coined the term by this point. ‡ One issue we should look at is allowing folks to edit the information they enter on the form in the event they need to change the feed—which a few do. That said, this introduces usernames and passwords that make the sign-up and barrier to entry a bit more cumbersome. This entry was posted in digital storytelling and tagged ds106, eden15, syndication, syndication bus. Bookmark the permalink. How odd I am not 100% sure I read that paper, it sounds like something you guys cooked up in a NY bar. Without any doubt ds106 has been the best thing I have been a part of. We sound like looney eyed cult members but there really is nothing like it and here, 5 years later it surges on. That it is not a thing no one person takes credit says a lot. It’s not owned by anybody. But mostly it is by design made of the stuff the Internet is made of. I do have some hopes this summer of rolling a lot of the things Ive done as custom code into some kind of plugin. Mark Luedtke at VCU is already on it with that comment thing, and it will be something we need for the fall VCU project because we have have 20+ sites each of them possibly a hub. Yeah the lack of ability to change feeds us a problem. Originally we did have accounts when we had BuddyPress on the scene but there seemed no reason to have people come back to the site. And it was overhead on WordPress for things we did not use. I am doing some stuff with the assignment bank theme where everything people do is tagged with their Twitter name as its unique. In lieu of accounts it might be possible to give each signup a unique URL if they kept would allow them to edit their feed. It’s something I thought about for SPLOTS because we don’t do accounts there. Nothing can stand up next to ds106, Nothing. Not that that matters, but hey…. So you know, Europe likes ds106 🙂 Just finished the keynote that this post was in many ways my working through these ideas. What is becoming increasingly clear to me is a number of folks have been working around some core ideas, many of which Brian and I framed in that fairly anarchic article, that have morphed into much of the work we are doing with domains, syndication hubs, spontaneous connections, collaborative work, etc. It’s cool to see we have a real arc and narrative to an approach to edtech that has real principles and chops. I’m proud to be an edtech within this community, it is #4life!